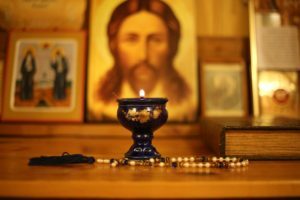 is an intellectual and spiritual home for Orthodox students that focuses on Eastern Orthodoxy’s broad, deep cultural and intellectual patrimony, especially that springing from the Greek, Arabic, and Slavonic traditions. Faculty are committed Orthodox Christians, dedicated to the education of our students that they might find their place in the universe in Christ. Students at the Center benefit from a rigorous education in the Great Books of Eastern Christianity, a daily cycle of Orthodox worship, and, as fully integrated students in the Eastern University system, are able to pursue accredited degrees in 35+ different fields. Eastern University’s scenic 90+ acre campus is located on a former estate in the historic “Main Line” area of suburban Philadelphia, close to the St. David’s train station (5 minutes) and a brief (20 minute) train ride into downtown Philadelphia. In addition to academic and spiritual opportunities for undergraduate students at Eastern University (including a minor in Orthodox Thought and Culture, on-campus Orthodox prayer services, and excellent lectures), some of the Center’s other main initiatives include the Basilian Journal and the Summer Program for Young Orthodox Scholars. The Center is directed by Dr. Gary Jenkins, Eastern University’s John H. Van Gorden Professor of History, chair of the department, and newest Agora Institute staff member. The Center is in the process of forming a Pan-Orthodox advisory board, including hierarchs, clergy, and laity.